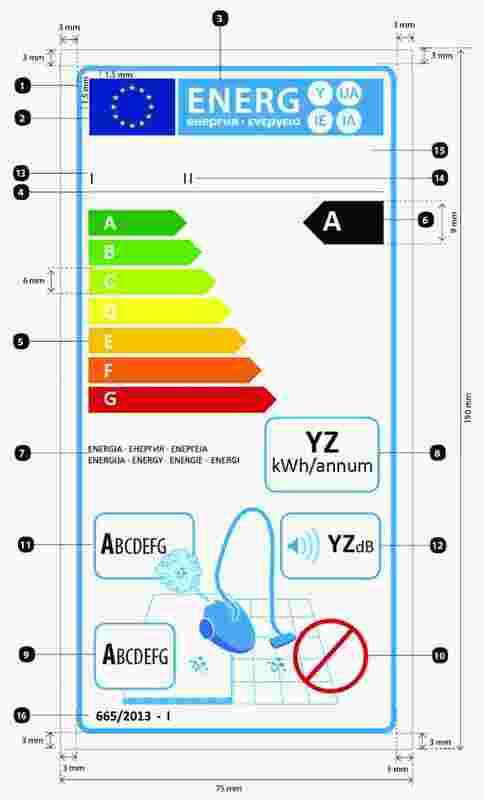 Directive 2010/30/EU requires the Commission to adopt delegated acts as regards the labelling of energy related products representing significant potential for energy savings and presenting a wide disparity in performance levels with equivalent functionality. The energy used by vacuum cleaners accounts for a significant part of total energy demand in the Union. The scope for reducing the energy consumption of vacuum cleaners is substantial. The information provided on the label should be obtained through reliable, accurate and reproducible measurement procedures, which take into account the recognised state of the art measurement methods including, where available, harmonised standards adopted by the European standardisation organisations, as listed in Annex I to Regulation (EU) 1025/2012 of the European Parliament and of the Council of 25 October 2012 on European standardisation (2). This Regulation should specify a uniform design and content for the label for vacuum cleaners. In addition, this Regulation should specify requirements as to the technical documentation and the fiche for vacuum cleaners. Moreover, this Regulation should specify requirements as to the information to be provided for any form of distance selling, advertisements and technical promotional materials of vacuum cleaners. 1. 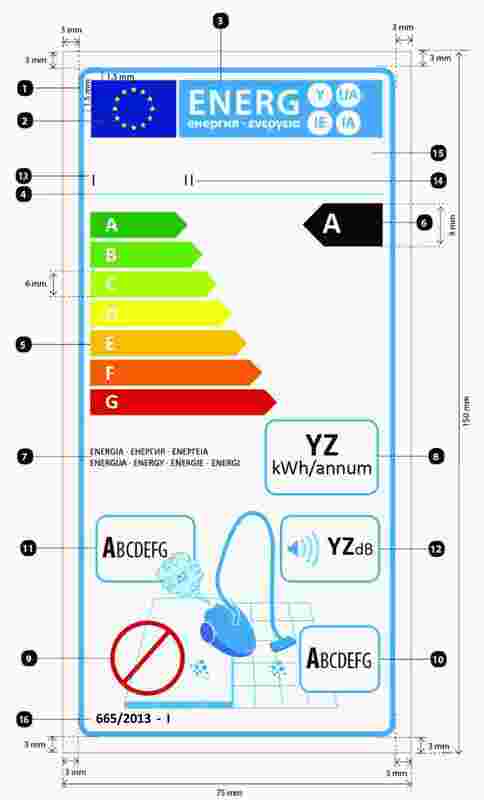 This Regulation establishes requirements for the labelling and the provision of supplementary product information for electric mains-operated vacuum cleaners, including hybrid vacuum cleaners. ‘equivalent vacuum cleaner’ means a model of vacuum cleaner placed on the market with the same input power, annual energy consumption, dust pick up on carpet and hard floor, dust re-emission and sound power level as another model of vacuum cleaner placed on the market under a different commercial code number by the same manufacturer. any technical promotional material concerning a specific model of vacuum cleaner which describes its specific technical parameters includes the energy efficiency class of that model. for vacuum cleaners placed on the market from 1 September 2017 labels shall be in accordance with label 2 of Annex II. any technical promotional material concerning a specific model of vacuum cleaner which describes its specific technical parameters includes a reference to the energy efficiency class of the model. The information to be provided under Articles 3 and 4 shall be obtained by reliable, accurate and reproducible measurement and calculations methods, which take into account the recognised state-of-the-art measurement and calculation methods, as set out in Annex VI. Member States shall apply the procedure set out in Annex VII when assessing the conformity of the declared energy efficiency class, cleaning performance classes, dust re-emission class, annual energy consumption and sound power level. The Commission shall review this Regulation in light of technological progress no later than five years after its entry into force. The review shall in particular assess the verification tolerances set out in Annex VII, whether full size battery operated vacuum cleaners should be included in the scope and whether it is feasible to use measurement methods for annual energy consumption, dust pick-up and dust re-emission that are based on a partly loaded rather than an empty receptacle. This Regulation shall apply to water filter vacuum cleaners from 1 September 2017. (3) OJ L 157, 9.6.2006, p. 24. (4) OJ L 374, 27.12.2006, p. 10. 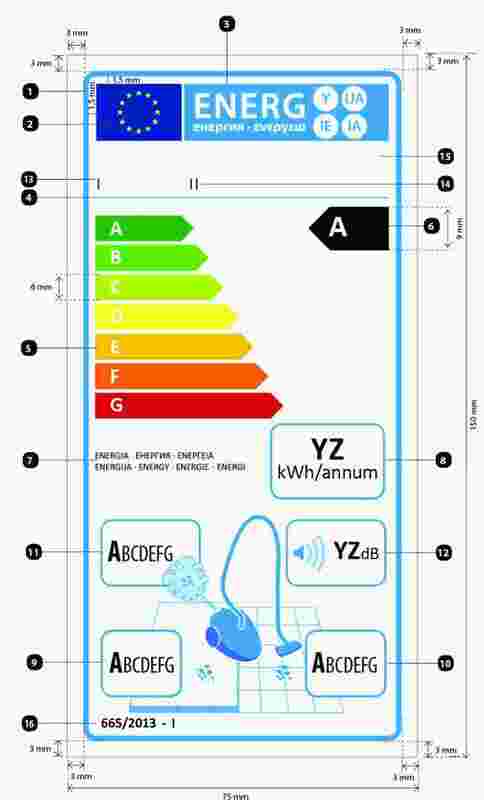 The energy efficiency class of a vacuum cleaner shall be determined in accordance with its annual energy consumption as set out in Table 1. 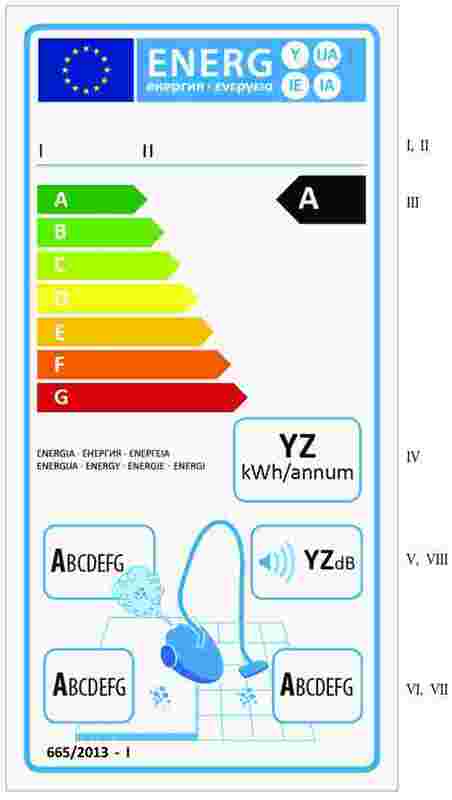 The annual energy consumption of a vacuum cleaner shall be determined in accordance with Annex VI. The cleaning performance class of a vacuum cleaner shall be determined in accordance with its dust pick up (dpu) as set out in Table 2. The dust pick up of a vacuum cleaner shall be determined in accordance with Annex VI. The dust re-emission class of a vacuum cleaner shall be determined in accordance with its dust re-emission as set out in Table 3. The dust re-emission of a vacuum cleaner shall be determined in accordance with Annex VI. Sound power level, as defined in Annex VI. The design of the labels shall be in accordance with point 4.1 of this Annex. By way of derogation, where a model has been awarded an ‘EU eco-label’ under Regulation (EC) No 66/2010 of the European Parliament and of the Council (1), a copy of the EU eco-label may be added. The design of the labels shall be in accordance with point 4.2 of this Annex. By way of derogation, where a model has been awarded an ‘EU eco-label’ under Regulation (EC) No 66/2010 of the European Parliament and of the Council, a copy of the EU eco-label may be added. Carpet cleaning performance class, determined in accordance with Annex I. The design of the labels shall be in accordance with point 4.3 of this Annex. By way of derogation, where a model has been awarded an ‘EU eco-label’ under Regulation (EC) No 66/2010 of the European Parliament and of the Council, a copy of the EU eco-label may be added. The information listed in point 1.1 shall be included in this label. The design of the labels shall be in accordance with point 4.1 of this Annex. By way of derogation, where a model has been awarded an ‘EU eco-label’ under Regulation (EC) No 66/2010 of the European Parliament and of the Council, a copy of the EU eco-label may be added. The information listed in point 1.2 shall be included in this label. The information listed in point 1.3 shall be included in this label. EU label border stroke: 3,5 pt – colour: Cyan 100 % – round corners: 2,5 mm. Energy logo: Colour: X-00-00-00. Pictogram as depicted: EU logo + energy logo: width: 62 mm, height: 12 mm. Sub-logos border: 1 pt – colour: cyan 100 % – length: 62 mm. Text: Calibri bold 18,5 pt, capitals, white; ‧+‧ symbols: Calibri bold 11 pt, white aligned on a single row. ‘kWh/annum’: Calibri bold 12 pt, 100 % black. Letters: Calibri regular 13,5 pt, 100 % black; and Calibri bold 18 pt, 100 % black. ‘dB’: Calibri regular 11 pt, 100 % black. Exclusion sign: border 3 pt – colour: 00-X-X-00 (100 % red) – diameter 16 mm. where the vacuum cleaner has been granted an ‘EU Eco-label award’ under Regulation (EC) No 66/2010, this information may be included. One fiche may cover a number of vacuum cleaner models supplied by the same supplier. specific values as indicated in points 3 and 4 of Annex VI as applicable. the results of calculations performed in accordance with Annex VI. Where the information included in the technical documentation file for a particular vacuum cleaner model has been obtained by calculation on the basis of an equivalent vacuum cleaner, the technical documentation shall include details of such calculations and of tests undertaken by suppliers to verify the accuracy of the calculations undertaken. The technical information shall also include a list of all other equivalent vacuum cleaner models where the information was obtained on the same basis. The information contained in this technical documentation may be merged with the technical documentation provided in accordance with measures under Directive 2009/125/EC. the sound power level, as defined in Annex VI. Where other information contained in the product information fiche is also provided, it shall be in the form and order specified in Annex III. The size and font in which the information referred in this Annex is printed or shown shall be legible. 1. For the purposes of compliance and verification of compliance with the requirements of this Regulation, measurements and calculations shall be made using a reliable, accurate and reproducible methods that take into account the generally recognised state-of-the-art measurement and calculation methods, including harmonised standards the reference numbers of which have been published for the purpose in the Official Journal of the European Union. They shall meet the technical definitions, conditions, equations and parameters set out this Annex. In case the vacuum cleaner is not equipped with a battery operated active nozzle the value of NP equals zero. 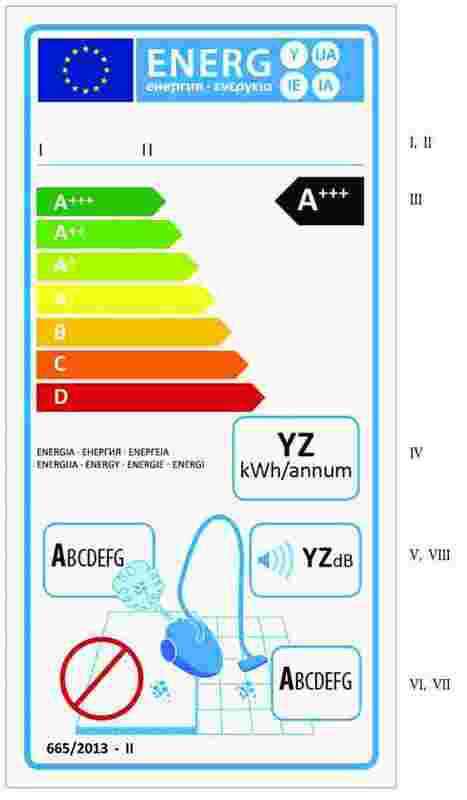 The vacuum cleaner model shall be considered to comply with the applicable requirements if the values and classes on the label and in the product fiche correspond to the values in the technical documentation and if testing of the relevant model parameters listed in Table 4 shows compliance for all of those parameters. If the result referred to in point 2 is not achieved, the Member State authorities shall randomly select three additional units of the same model for testing. As an alternative, the three additional units selected may be of one or more different models which have been listed as equivalent vacuum cleaner in the manufacturer's technical documentation. The vacuum cleaner model shall be considered to comply with the applicable requirements if testing of the relevant model parameters listed in Table 4 shows compliance for all of those parameters. Member State authorities shall use the measurement and calculation methods set out in Annex VI. The verification tolerances defined in this Annex relate only to the verification of the measured parameters by Member State authorities and shall not be used by the supplier as an allowed tolerance to establish the values in the technical documentation. The values and classes on the label or in the product fiche shall not be more favourable for the supplier than the values reported in the technical documentation. The determined value (1) is not greater than the declared value.